Our wedding seems so long ago in some ways, and in others it seems like it was just yesterday that I was waking up to marry my best friend! 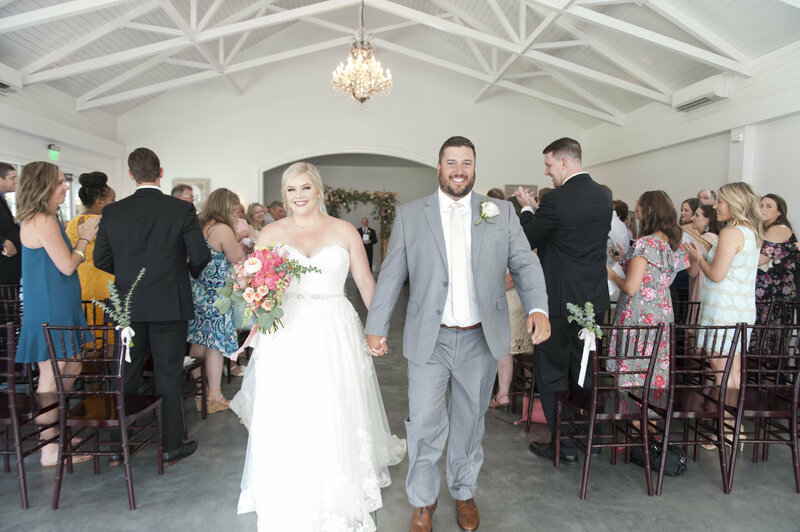 I finally have had time to adjust to our new busy schedule with school, coaching, and house stuff, so I’m excited to share some details from our big day! We got engaged December 5, and I knew I wanted a summer wedding since I adore the heat even though Raleigh summers are torturous. 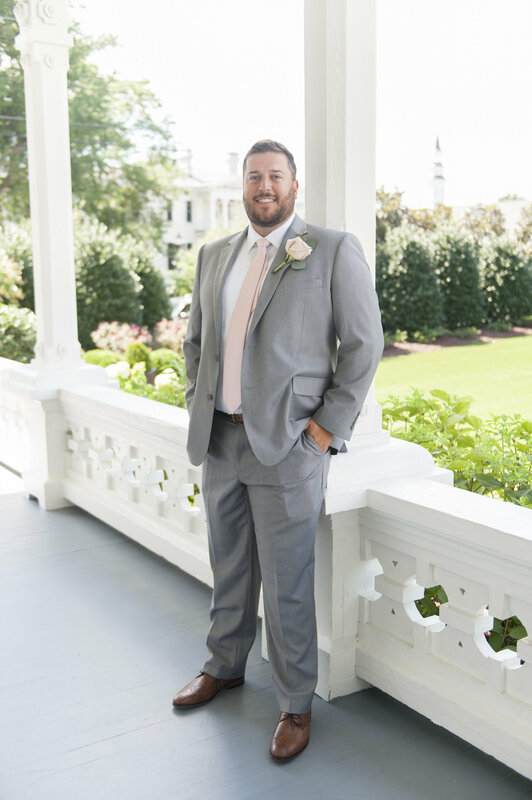 Since we are both high school teachers and with Andrew’s coaching commitments, it didn’t seem very doable to have a wedding during the school year, much less a honeymoon, and I never wanted to have a Christmas wedding because it’s already such a busy time. So summer it was! We went with a Sunday wedding because the venue we both loved was PERFECT, but also came with a nice price tag. Sundays are always less expensive, so that’s what we could afford. 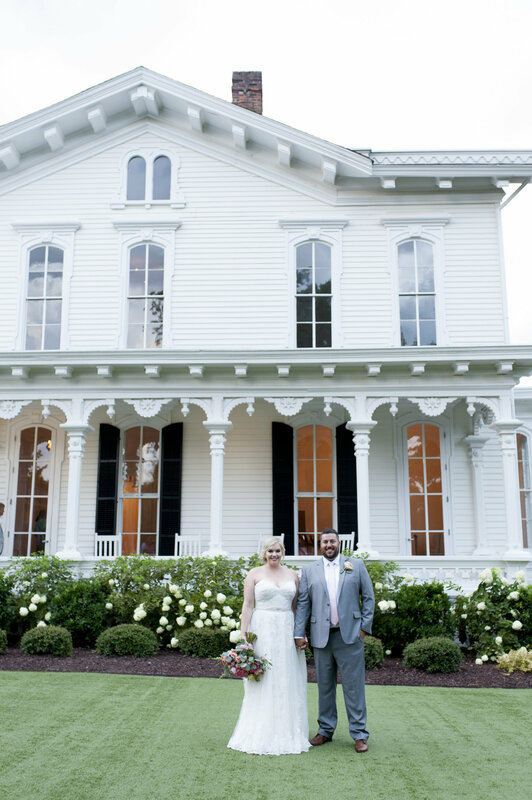 We settled on the Merrimon-Wynne House in downtown Raleigh because it was just gorgeous, but mostly because they had a beautiful indoor space with air conditioning for the ceremony – a must for a Raleigh July wedding. Since I’m already an organized person, I wasn’t terribly worried about taking on the planning itself. I knew I would have the first part of summer off to be able to focus on all the small, last minute details before the big day. Still, planning a wedding is very stressful. It is just so many decisions – and I’m pretty good at making decisions – but when it came down to a final guest count, who to invite, where to seat everyone, etc. it became almost impossible at times. I never want to hurt anyone’s feelings, and no matter how many people tell you, “It’s about you and Andrew, don’t worry what anyone else thinks,” you still worry that you’re upsetting someone at every turn. I made several lists and edited them along the way. I had a master list when I first started planning, then I made a 3 month, 2 month, and 1 month list, and then I counted down by the weeks! There was just so much to do that keeping everything in an organized list saved me. I also set a lot of reminders on my phone and made a separate email folder for wedding stuff. My mom was helping from Asheville, so being able to send her emails of all of the confirmations from vendors was really helpful! 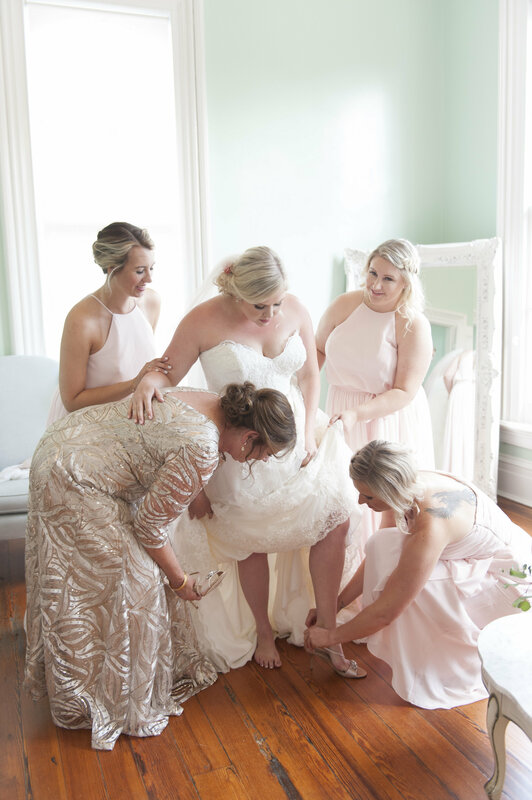 It also helped that my best friend Whitney got married a couple months before me, so I was able to ask her advice on a lot of things or write things down as they came up for her so I wouldn’t forget this or that. 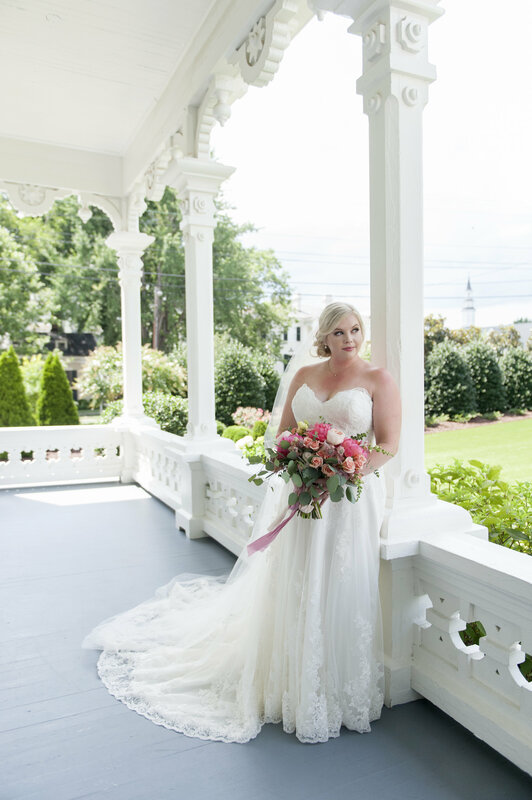 Our colors were blush pink and accents of gold and wood. There was also a lot of greenery and then pops of color in the florals throughout. I guess for a theme I’d say we went with just classic and elegant, but not too over the top. It wasn’t glam or blingy because that’s just not my style or taste, and the wedding wasn’t super formal, either. 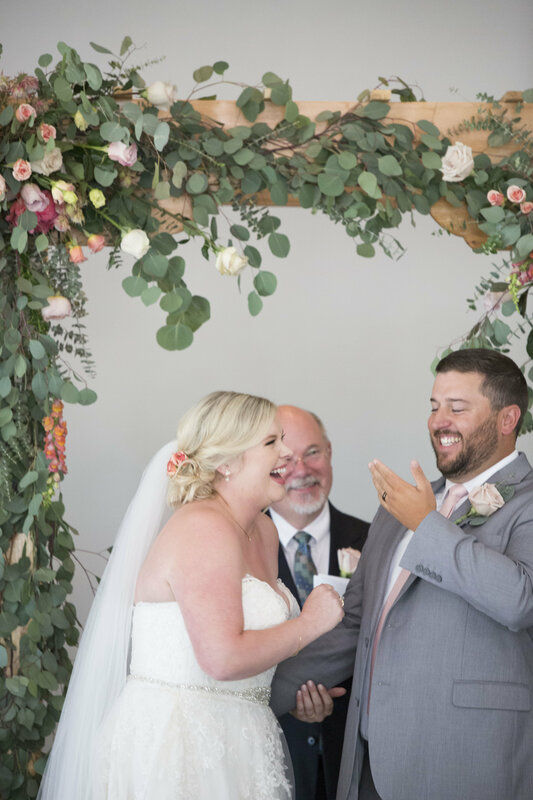 A couple of my favorite details were that my dad built our arbor/pergola that we stood in front of for the ceremony, and he also built our bench that we sat on at the head table! We will get to keep both of these things in our new home and I can’t express how special it was that he built them for us! He surprised us with a music box built in underneath the bench that plays the wedding march and has A + J carved in it – I cried when he told me! My dad builds beautiful handmade guitars and has built many things in his life, but these two items are the most near and dear to me. 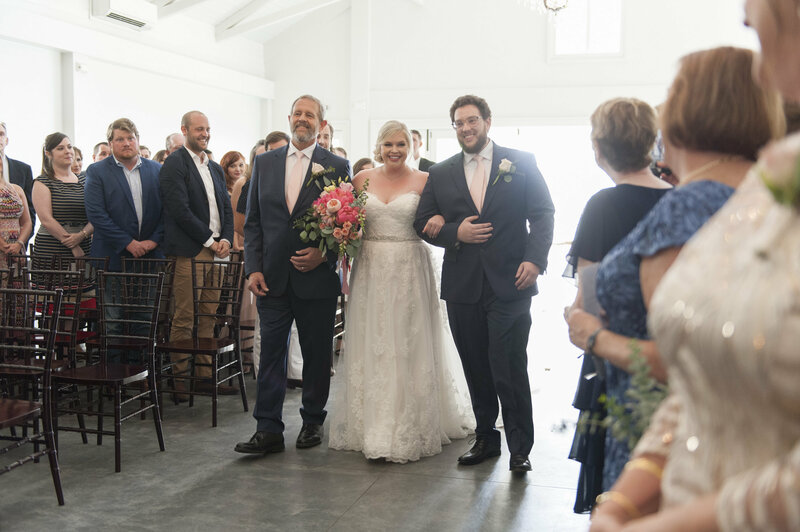 my brother & dad both walked me down the aisle; when my dad gave me away he tripped on my train and it was comic relief! that’s the pergola he built us! 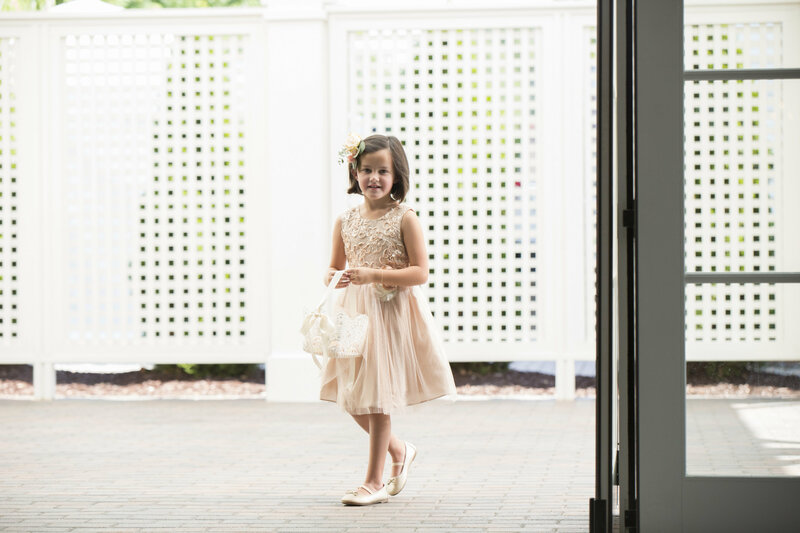 The day of the wedding, I woke up and got in my soft clothes and packed everything I needed for the day – so much to remember! I called Andrew and talked to him to just check in and calm my nerves. 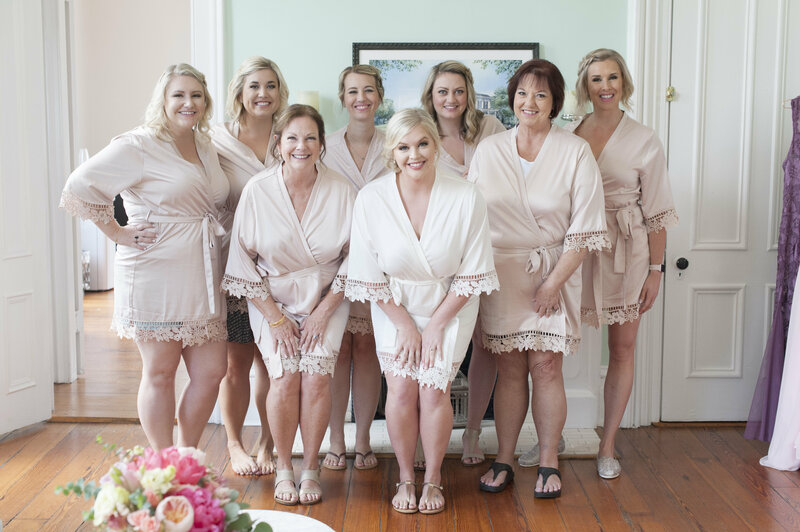 The girls spent the day in the bridal suite which was amazing, getting our hair and makeup done, taking pictures, having snacks, and just being girls! Andrew’s mom got ready with us, too, which was so nice! 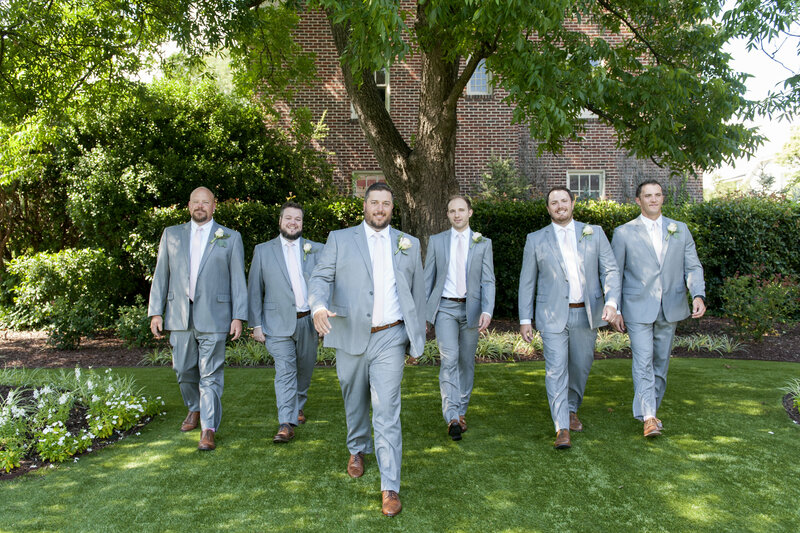 The guys arrived in the afternoon after all of our photos were done (that way Andrew didn’t have a chance of accidentally seeing me!). We didn’t do a first look because we are both very traditional. Andrew and the guys got some time to hang out in the groom’s suite across the hall, with a TV and foosball. 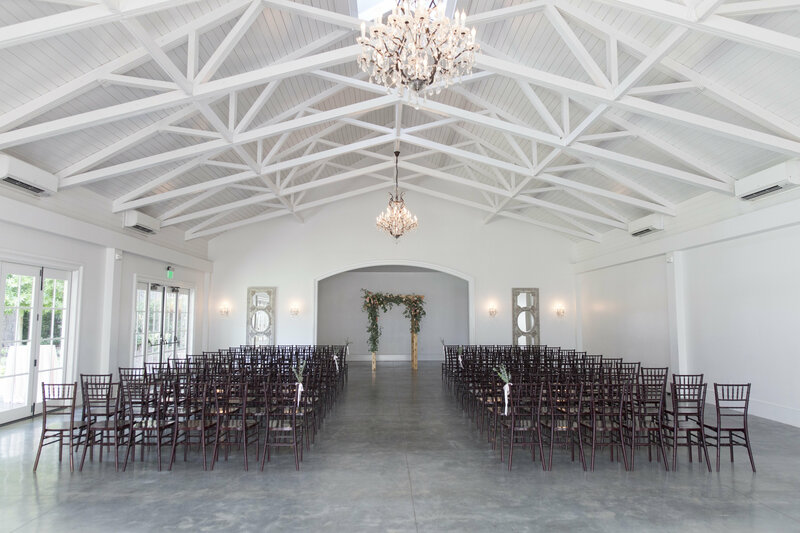 Right before it was time for the ceremony to start, the venue planner came to get all the girls and I had a moment alone to myself. I listened to “Found a Heart” by Emily Hearn – look it up! The perfect song to listen to before getting married. 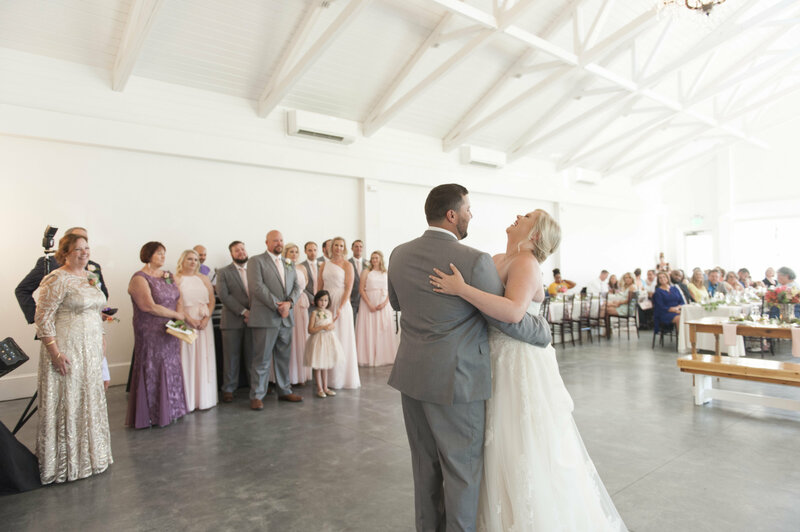 Our first dance song was also by her: “Like Ships Need the Sea” – the acoustic version. My bridesmaid Lindsay who works in the music industry GOT EMILY HEARN TO MAKE A VIDEO OF HER AND HER HUSBAND PERFORMING THIS SONG for our wedding gift!!! So incredible that we will always have that video to cherish of our first dance song. 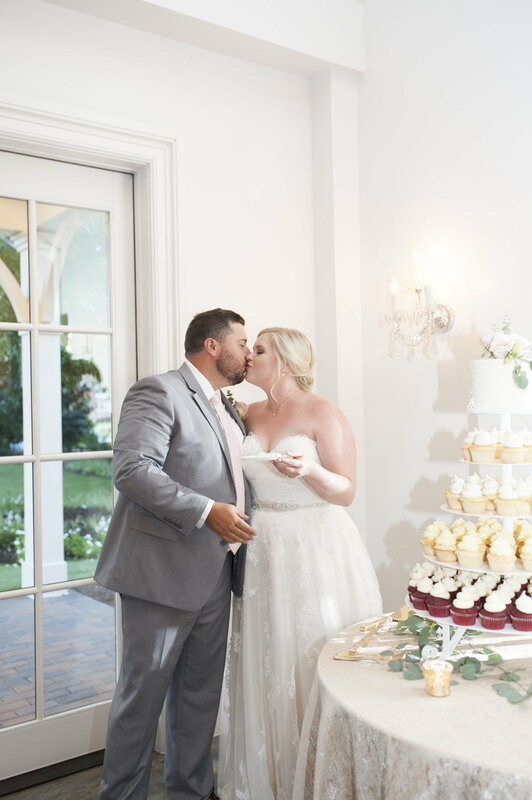 Our vendors were incredible, and I loved working with all of them! 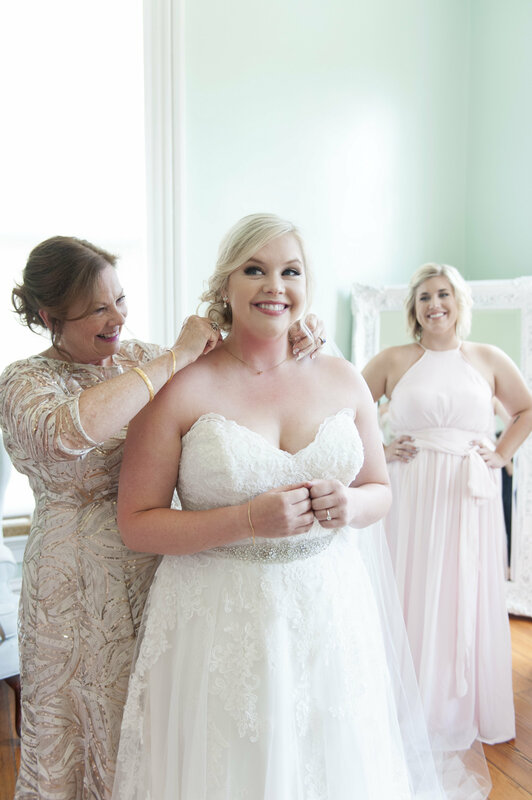 The only bad experience was with the person I selected to do my hair – but we got that worked out and I am listing the salon that actually ended up doing the bridal party hair for the wedding, which I was so delighted with! I can’t say enough good things about these people and the way they made our vision come to life! Guests have continued to rave about how delicious the food was, how beautiful the flowers were, etc. and I’m just so glad everything came together for Andrew and I to be married without a hitch! 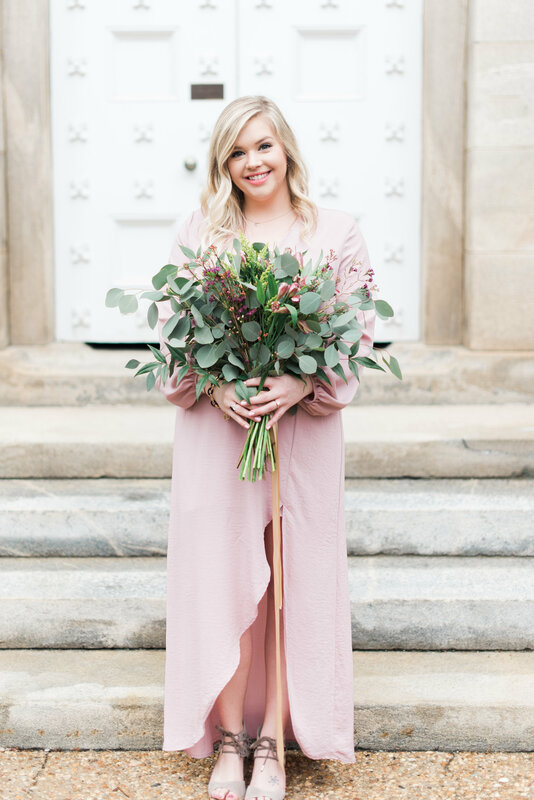 The day went by in such a blur so I am forever grateful to Erica and her second shooter Zoe for capturing these amazing moments throughout my favorite day of my life! 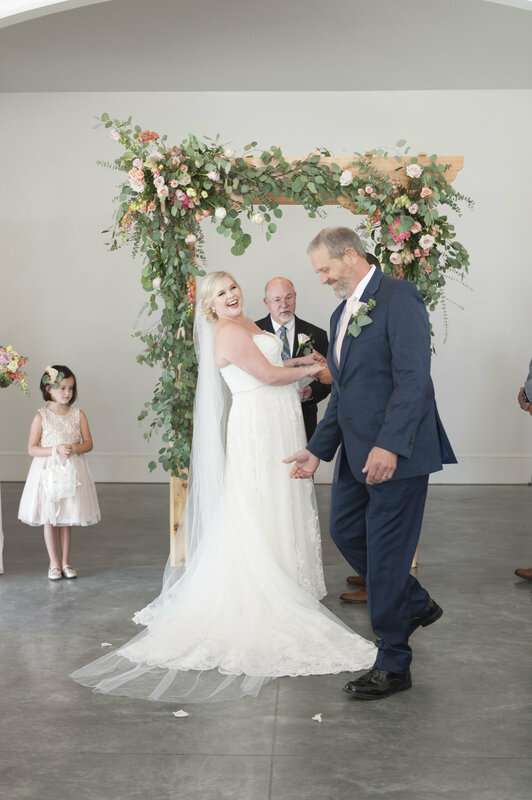 Those are all of the main points, but it was such a fantastic day and weekend – and I can’t believe we have already been married for over a month! I hope to post about all of the little details soon, but here are some photos to hold you over until then! Love all the pictures., and I didn’t know your dad made all of that stuff!! SO sweet!